Summerville Place was built in three phases and totals 400 houses. The builder, Crosland Corporation (since purchased by Centex homes) planned the community with ponds, forested areas, and allowed for an amenities area. The development plan for the amenities area is done by you, the homeowner, along with your neighbors. 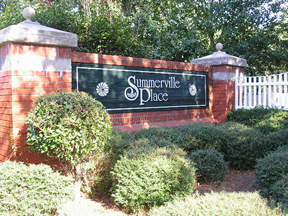 Summerville Place is located on the fringe of the town of Summerville. Police, Fire, and other emergency services are provided primarily by the town of Summerville. Dialing 911 will get you Summerville operators. If you dial a mobile phone 911 will get you to Charleston operators. From the mobile phone dial 075-1650 to reach the Summerville Police.Public Schools are located in Dorchester School District Two.